Aces and Faces Power Poker follows the same rules as the Aces and Faces game but with a simple twist: you play 4 hands at once. 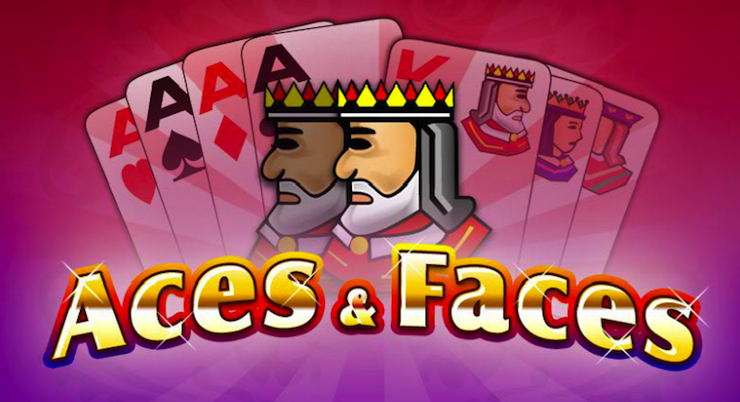 Aces and Faces Power Video Poker also includes a special feature which will allow you to double your winnings with a single bet so you'll love this new twist on an old favorite. To start playing, choose your stake. You can bet anything from 1 to 5 coins on each hand, and as with most other video poker games, betting the maximum coinage is always advised because it gives you a bigger jackpot and it also gives the house the lowest edge. Then press the Deal button, and the Dealer deals you 5 cards. Select which of these cards you want to throw away and which you want to keep by pressing the relevant button below each card. Press the Draw button and the cards you have elected to throw away will be replaced in each of the hands you are playing. The cards you decided to hold will appear on 4 different rows on your screen along with other cards dealt to you to make up your 4 hands of 5 cards. The hands with the biggest rewards are 4 Aces or 4 Face Cards (Jacks, Queens and Kings). Another fun addition to Aces and Faces Power Video Poker is the Double Feature. You can bet your pot against the dealer, who then deals a hand face down. You pick one card and if your card beats the dealer's your winnings get doubled. You can take your win by pressing Collect.